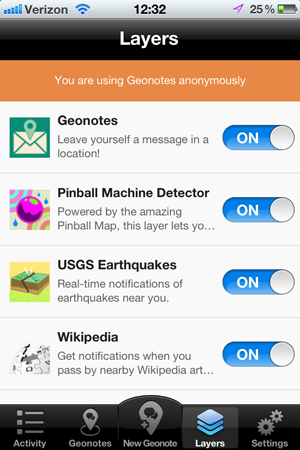 Introducing Geonotes for iPhone and Android! The Geonotes App is here for iPhone and Android! Today we’re annouching something big! 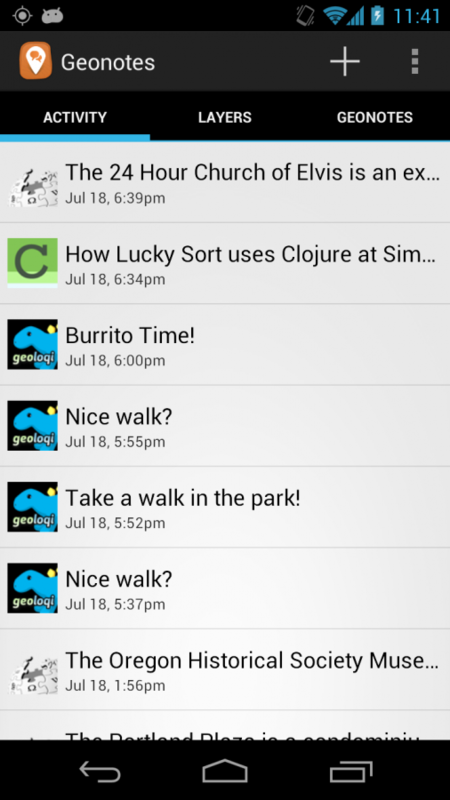 An update to the Geoloqi app. This demo app is the update to the app we released over a year ago. Since then, we’ve released geofencing and real-time SDKs for iPhone and Android. It’s sometimes hard for us to find time to work on apps directly, because our focus is on building a great geofencing platform for mobile development, which is a lot of work. We wanted to revamp our Geoloqi demo app to take advantage of the battery and accuracy improvements in the SDK, and also provide a way to have people subscribe to the free geo layers that we like to make in our spare time. 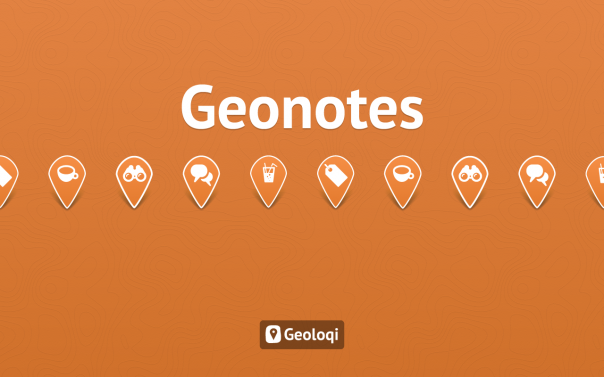 Last month, we finally got a chance to sit down and re-write our demo app to use the new SDK, and the result is here: the new Geonotes app from Geoloqi! With the Geonotes app, you can finally provide battery-safe location context to your daily life: Instead of having to pull out your phone and slowly dig up information every time you need it, your phone becomes your sidekick. When you are in a certain location, it will provide information that is only useful to you when you are in that location. Get it now for iPhone and Android! Geonotes is available now for download in the App Store and Android Market. Download it now, add some geonotes, subscribe to layers, and see how fun it is to have location-based knowledge work for you! Now all of your geonotes and layer notifications show up in a stream on the app! For example, when I went shopping, I would always forget to buy bananas, and then regret it when I didn’t have any for breakfast the next day. So with the Geonotes app, I have created a reminder for myself that reminds me to buy bananas when I’m shopping, so I don’t forget. You can also subscribe to Layers, which are plugins to the Geonotes app that provide information for you based on your location. For example, the Wikipedia layer will provide links to articles and a brief description when you walk by places that have Wikipedia pages. I turn it on when I’m visiting new cities, because it’s a great way to get a tour of the city just by walking around. There are many other layers, including one that notifies you when there was a nearby earthquake. And the Pinball Map layer, which will let you know when you’ve walked near a place that has pinball machines! And because it’s powered by the Geoloqi Platform API, developers can program with this content to their hearts content. 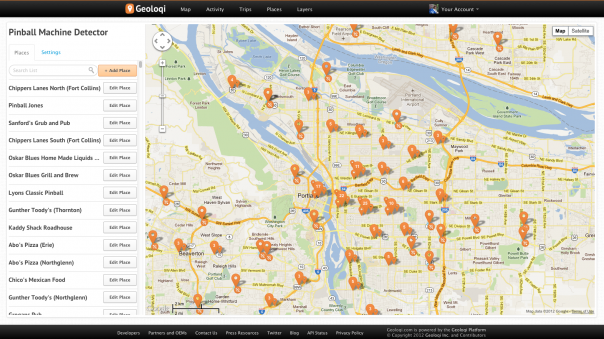 Using Geoloqi’s developer tools, you can make your own layers to add interesting geo-location content. For example, instead of leaving a Geonote to remind me to get bananas, I could program it to provide a shopping list when I’m at the store. If you make any interesting layers, let us know! We’ll add it to our global list of layers. Genotes only does ambient background tracking. To enable real-time tracking, use our GeoTracks app, available for Android (and iPhone, shortly). Want these features in your apps? Check out the Geoloqi Platform. With SDKs for iPhone and Android, you’ve got the majority of the market covered. Or if you want to develop for both devices at once, try the Geoloqi module for Appcelerator’s Titanium platform! Geoloqi has a new layer that is going to make your coin jars a lot more empty. When we’re not working (which we love to do), we also love to play pinball. It turns out (we only recently found this out) that the city we live and work in is one of the top pinball cities in America). There’s a great website called the Pinball Map that (using crowdsourcing) keeps track of the pinball machines in cities all over the country. They also have a a great iPhone and Android app so you can update and find machines (Scott Wainstock and Ryan Gratzer worked on the apps and the Pinball Map site, and did a great job with them). 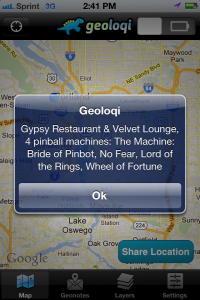 We wanted to see if we could use Geoloqi to automatically let us know when we were near a bar with pinball machines. So we combined the Pinball Map data with Geoloqi, and the result is the Geoloqi Pinball Machine Detector! How it works: When you walk by a venue that has a pinball machine, Geoloqi automatically detects it and sends you a message, which has the name of the venue, and the names of all the pinball machines. We tried it out recently, and it was great. We first found a bar with CSI and the new Batman pinball machine, both of which were only a week old (the Pinball Map data is remarkably up-to-date). Next we walked by the Shanghai Tunnel, a bar in downtown Portland, which had five machines in the basement. The machines weren’t visible from the road, so I would have never known about them without the Pinball layer. I’ve found a lot of great new places to stop in and visit since I started using it. It’s surprising how many hidden gems you can find, even in the neighborhood you live in. We also found a really odd Elton John pinball machine (Captain Fantastic) in the shoe store across from Powell’s (a big bookstore in downtown Portland). We’ve walked by it hundreds of times, and still had no idea it was there. Anything with geo-location can be made into a layer like this. We’ve been having a lot of fun implementing these, and we’re always looking for more ideas and datasets to import in the future. If you have any ideas in mind, you should send them to us (or better yet, make your own layer!). If you’re in any of the following cities, you can use this layer to get Pinball notifications! 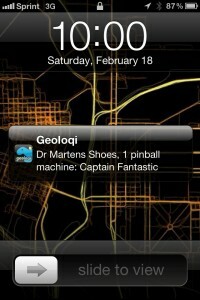 Download the Geoloqi app and subscribe to the Pinball layer! It’s free.. unlike the pinball machines.